If you have yet to try and carve a pumpkin in a 3-D manner you need to. 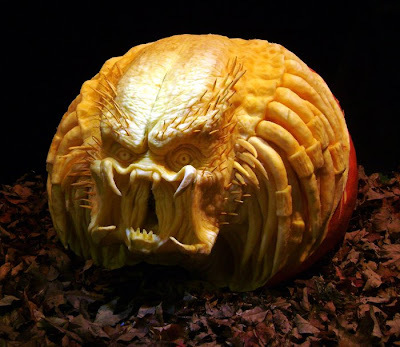 Its fun and everybody enjoys a cool pumpkin. Unfortunately they begin to rot less than a week after carving so be sure to take plenty of pictures. You can experiment with ways of preserving them but I find nothing works better than a nice photo. Some chefs that I have carved for put lemon juice on the faces to help slow down the natural molding process that will occur. Picking out the right pumpkin is very important. You need a pumpkin with a thick wall. To get this kind you will have to choose one that is very heavy for its size. Also avoid perfectly round pumpkins and opt for ones that have a protruding ridge that sticks out on one side. These shapes make nice faces as you could imagine how difficult it would be to carve a 3-D face onto a shallow flat surface. For Northern Michigan locals I would recommend Bolts Farm just south of Charlevoix. His pumpkins are thick and ideal for this type of carving. 1. large clay ribbon loop...peels the rind off the pumpkin beautifully as well as does 90% of the carving, minus the small details. 1. medium clay ribbon loop...more blocking in of the face 2. mini clay ribbon loops....smaller details, especially around the eyes. 1. Xacto knife and paring knife for sharp defined lines and cuts. Using the large loop, peel the pumpkins skin. Shave away the deepest areas, such as the area below the nose and the eyes sockets. Be brave, go deep. Unfortunately if you go too deep you'll break through and have to get a new pumpkin and start over, but if you don't go deep enough it just will not look as impressive. After a few hundred mess ups you will begin to know just exactly how thick your pumpkin are. The grain will become more fiberous as you approach the center. Every year I accidentally break threw a few. Typically I put my fist through the face, throw it out to the deer and start over. This pumpkin had a curve in it so I used it to my advantage when composing the face. The smaller loops work well for getting small deep cut areas such as the inner mouth. Use the paring knife to create nice sharp creases along the smile marks ans nostrils. To obtain these creases make 2 angled cuts and pull the wedge out. Paring knives have a nice curve to the blade allowing for better ability around curves. Small loops are great for blocking in areas such as stiches. Be sure to also utilize a knife later so that the details of the stitches become crisp. After blocking in the eyes with the loops I then add crisp lines with the paring knife. Use an xacto to draw the pupil and lift out some meat to create shadow. The loops can create wrinkles that are softer. Draw the teeth in with an xacto knife, then using your paring knife cut the edges off the teeth at a 45 degree angle. Hard to explain but the pictures may explain.